Having more than one hard drive in your PC not that uncommon for one reason or another. Sometimes, having access to those drives is just as important as having them. The days of locking your drives behind your case’s side panel are gone, and products like SATA cages / backplane make accessing your drives easy. For me, having a number of 2.5″ SSDs with varying operating systems fulfills my needs for testing, working, and playing. Instead of selecting which drive I want to run through the BIOS, I simply pop that drive in my SATA backplane and I am off and running. Recently our Vantec EZ Swap F4 MRK-425ST-BK 4 Bay HDD rack has decided that its 40mm fan would sound like a bicycle with a baseball card running through the spokes. 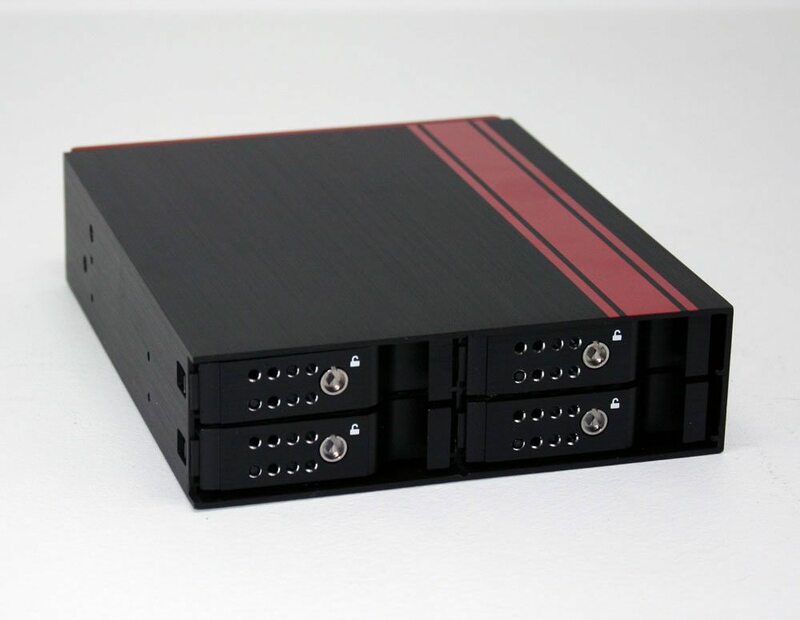 Can iStarUSA’s BPU-124DE-SS unseat our current hardware? Let’s find out. 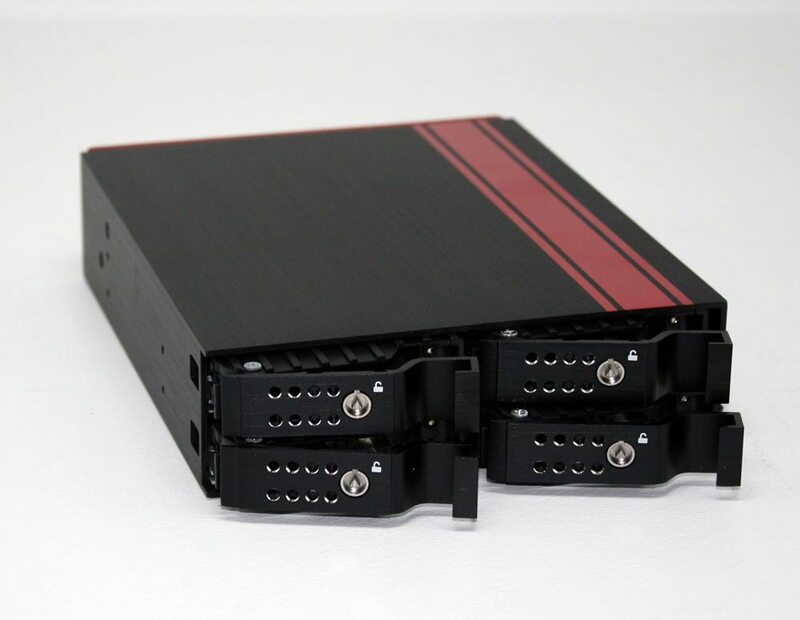 iStarUSA’s BPU-124DE-SS is a 5.25″ bay device capable of housing four 2.5″ hard drives comfortably. 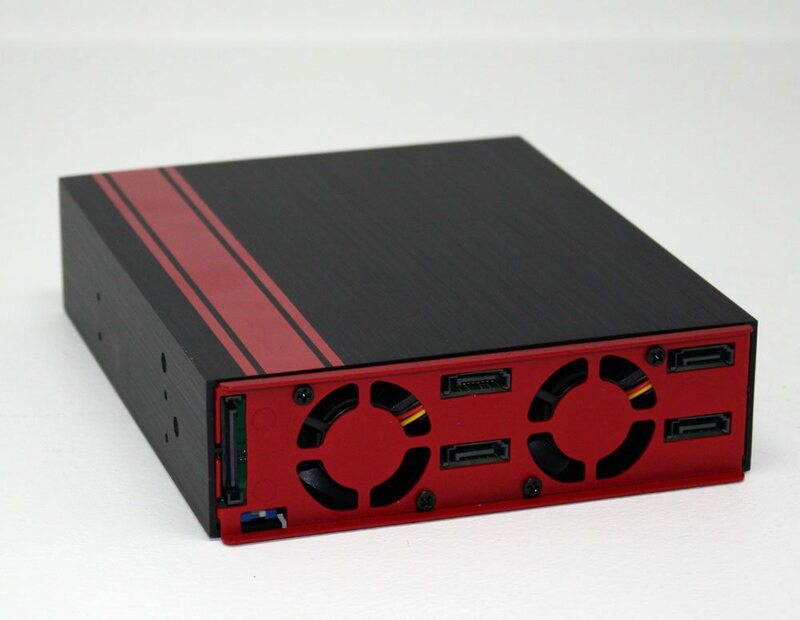 The all aluminum enclosure features two 40mm cooling fans, LEDs for power and HDD activity, a key lock to keep those pesky fingers from removing your drives, a single SATA power connection, and a cool red racing stripe! The unit measures 146mm x 41.9mm x 180.1mm and you can feel the difference that the all aluminum construction makes when holding it. 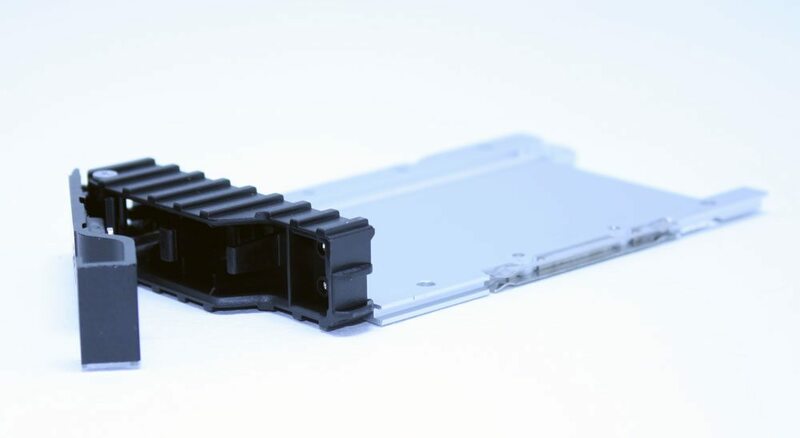 The BPU-124DE-SS can support 2.5″ hard drives with a thickness of 7mm to 15mm. The unit supports SATA I/II/II and SAS I/II. In the box? Some instructions, screws, keys, and the unit. No SATA cables or SATA power connection extensions. No fluff… just business. The front of the unit is home to the four removable drive trays and each drive tray has a release and locking mechanism. The LEDs on the drive trays will blink red quickly if you are suffering from overheating and blink red slowly for a fan failure. Power on is Blue and accessing is Purple. Around back, you find the two 40mm (3500 RPM) cooling fans, the SATA power connector, four SATA/SAS connections, and a switch to disable the HDD LEDs. If you plan on flipping the switch to disable the LEDs, keep in mind it doesn’t disable them completely. It will just keep them from blinking during activity. The back is painted a LOUD red color to match the go faster stripe on the top. Installing hard drives is a breeze. 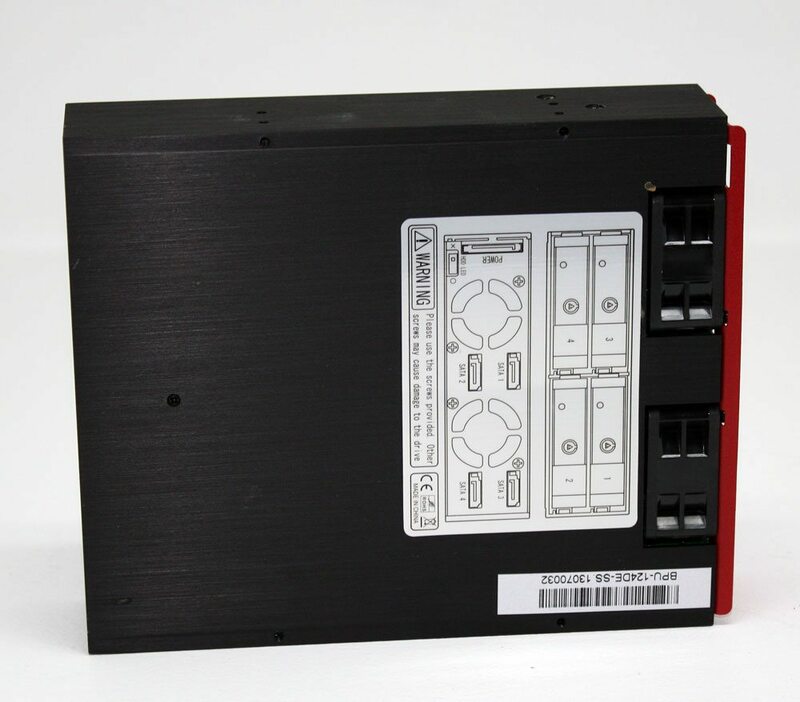 The each of the drive trays have standard mounting holes drilled for all 2.5″ hard drives. SSDs and HDDs of varying heights fit without issue. Other than the stubborn feel of aluminum on aluminum, the drive trays insert cleanly and latch with ease. Every time I pull a drive or insert a drive I get that chalkboard feeling. The aluminium hinge is fixed to a plastic housing unit with some simple catches to keep things in place. Unfortunately, the key lock turns to plastic to lock… more like a deterrent than a lock, but hey… locks were only meant to keep honest people out. They can be bypassed with some effort, but will render the plastic locking retention mechanism useless afterwards. During installation, it was realized that this is not as easy as you would expect… depending on your chassis. 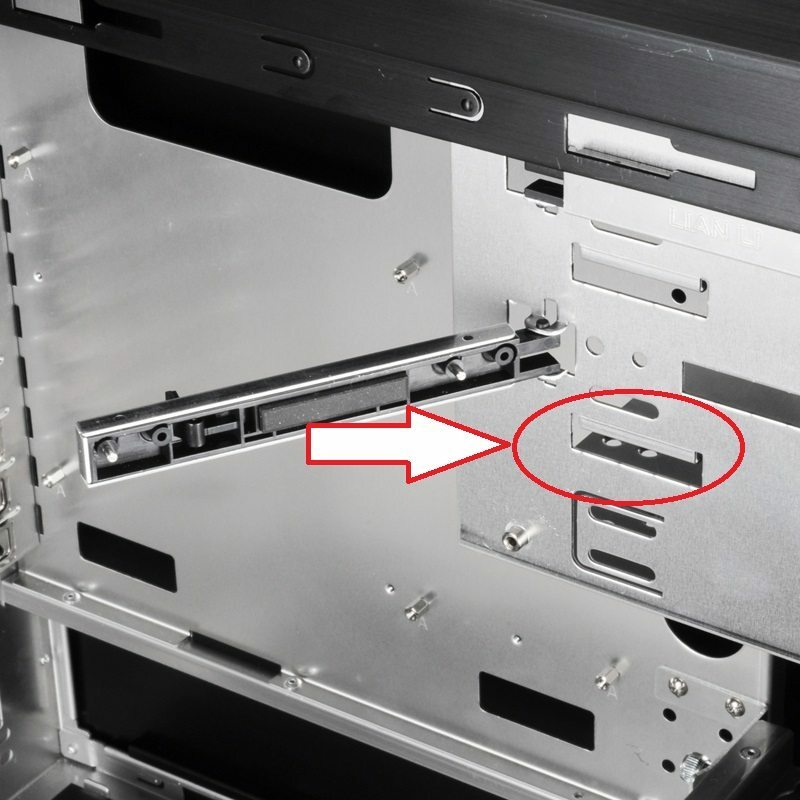 Cases like the Lian Li PC-6 have supports for 5.25″ drives to hold them in place during installation. These interfere with the height of the BPU-124DE-SS and require you to modify your chassis if installation is a must. If your case doesn’t have these, you are good to go. As far as performance goes, benchmarking indicated that there is no hit to performance by using the drive cage. These results are expected as this unit only acts as a pass-through, intelligence is handled by your motherboard or RAID cards. Putting it all together, the BPU-124DE-SS is a good-looking and sturdy unit. The drive trays are well made and the all aluminum construction compliments any chassis. 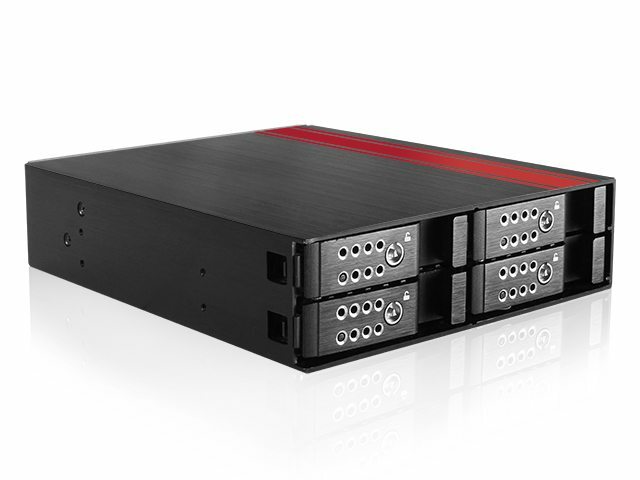 The BPU-124DE-SS can provide you with quick access to a number of drives easily. Due to the size (height), installation in some cases could be an issue. I don’t consider this a design flaw of the unit, just the way things go sometimes (check your case first). With a price tag of between $62.00 and $70.00, it isn’t the cheapest option out there, but factoring in craftsmanship and materials makes it an easier pill to swallow. Bottom line, this is a well made cage with great looks and quality materials. Two fans will help to keep your drives “as cool as the other side of the pillow”. The BPU-124DE-SS is an excellent 2.5" hard drive accessory, giving you quick access to your drives for any number of reasons.